Emily McFarlane, Jeannette & Jimmy Eckert and John Goodspeed each provided The Green Angels an unbelievable amount of support. John Goodspeed made countless trips to pickup donations and make deliveries to clients all around Wayne County. He is always there when we need him, giving us unconditional support every week. The Eckert family has supported us in various ways including hosting fund raising benefits such as Cruisin’ for a Cause and Chicken BBQ’s with dozens of vendors for a family day out. Additionally, they were instrumental in modifying our storage space with much needed shelving to increase efficiency of our operations. Lastly, Ms. Emily McFarlane exemplified through out the year what it means to inspire those around you, regardless of their age. She coordinated multiple donation drives that relied on student participation and raised awareness in the community. Her efforts resulted in loads of toys, books, coats and more to benefit children in need around Wayne County. She continues to serve as a fine example of what makes The Green Angels so special. She has inspired kids to participate generously, fully understanding the power of “Giving forward and back”. 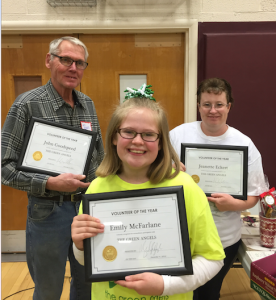 Congratulations to our Volunteers of the Year in 2015!